recommends research needed to improve methane emissions measurement, monitoring, and inventory development. This workshop serves as the first of several meetings that will be held to inform the committee in the development of their report. The committee anticipates gathering information on a wide variety of topics related to their charge throughout the study. Because this workshop will take place in Boulder, some emphasis has been placed on topics relevant to the expertise of local scientists and stakeholders. What are the strengths of each approach relative to other techniques and what are the primary sources of uncertainty? Are there specific questions or analyses that lend themselves best to one approach vs. another? Which techniques are used for inventory development? Can these approaches attribute methane to nature vs. anthropogenic sources and individual source sectors? What are limitations of top-down vs. bottom-up methods (in general)? How does new research affect our understanding of methane sources, their comparison/reconciliation (spatially and temporally), and the uncertainties associated with current measurement approaches? Can new research help to reconcile the existing discrepancies between top-down vs. bottom-up measurement approaches? How does that latest research compare with existing inventories? What are the largest uncertainties associated with methane measurements and/or activity data in these sectors/settings? Are improved methodologies needed to estimate the magnitude of emissions from these sources relative to the sectors known to dominate anthropogenic methane emissions? Session objective: to learn about how methane inventories are used at the state level and discuss how study results can best be reported and presented for policymaking. What are the challenges for using existing methane inventories? What changes in reporting study results and emissions data would facilitate easier use by policymakers and others interested in comparisons across measurement approaches? 4:15 P.M.: Townhall discussion, to allow all workshop participants to offer additional contributions to the discussion. This workshop serves as one of several meetings being held to inform the committee in the development of their report. The committee anticipates gathering information on a wide variety of topics related to their charge throughout the study. Because this workshop will take place in California, some emphasis has been placed on topics relevant to the expertise of local scientists and stakeholders. What are the current challenges for measuring methane emissions for state or regional scale inventory development? Are these similar or distinct from challenges of developing a national scale inventory? What are possible ways the current challenges in methane data collection and reporting could be addressed by the research community? How can data be made more readily usable by policy makers? What are the primary methane emissions information needs for various stakeholder groups in California? What information (local, state, or national) on methane emissions is needed from the research community to improve data collection or usability of existing data? What are the strengths and weaknesses of existing data? How is this information used in the state regulatory process? What are the largest challenges to the agricultural sector with respect to methane emissions? What additional information is needed to improve measurement methodologies and/or the development of inventories? 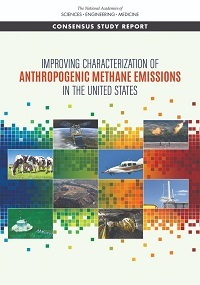 The release of Improving Characterization of Anthropogenic Methane Emissions in the United States took place on March 27, 2018. James White of INSTAAR and University of Colorado, Boulder, discussed the report’s findings and recommendations.